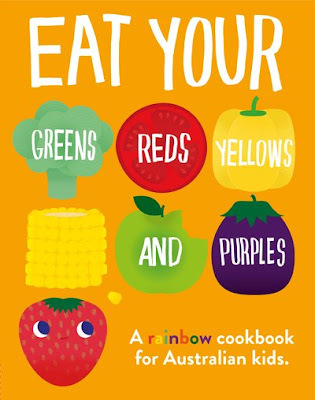 Eat Your Greens, Reds, Yellows, and Purples - A Rainbow Cookbook For Australian Kids. This cookbook is a fantastic way to get your kids not only cooking in the kitchen, but it also provides them with nutritional information about fruits and vegetables. There are some seriously delicious and healthy recipes included in this cookbook, which are divided up into sections according to their colour. In the green group, some of the recipes include Spinach and Filo Tarts and Zucchini Frittata. In the red group, Tomato Soup and Red Capsicum Hummus are featured amongst other yummy meals. Layered Berry Cheesecake and Eggplant and Tomato Bake are a couple of recipes from the purple group. Cornbread Mountain and Lemon Drizzle cake are featured in the yellow section. And finally, in the orange group, your child can attempt Butternut Pumpkin Soup or Mango and Coconut Icy Poles. The cookbook includes safety rules, and an equipment guide aswell. There's plenty of helpful hints, and information about the importance of eating a healthy, balanced diet.